Phoebe was too far away to sense whether the boy had one heart or two. Through the maze of trees with clattering leaves, she could see him moving with purposeful speed. He was headed toward her destination—a brownstone chapel perched at the top of a small hill. Not knowing the boy’s nature made Phoebe hesitate. Then came the sound of tower bells. Eight o’clock. There was no time to think of an alternate route. She was officially late for the Conversion. A loud, echoing crack quickened Phoebe’s pace as lightning slashed the indigo sky above her. She had barely reached the base of the hill when rain began pounding down. Clutching the camera that hung from the strap around her neck, she sprinted the final stretch, arriving breathless. Phoebe wiped the rain from her face, and then entered the chapel. Inside, light from moon-facing windows cast a misty glow across the sanctuary, the air redolent with the smoke of a blazing fireplace. She glanced around the heart of the nondenominational Green Lane Academy. It seemed so ordinary, so quiet, even peaceful. Rows of pews with velvet cushions ran the width of the room. She moved between them, taking care to remain in the shadows. An irregular shape in a dark corner caught her eye and Phoebe could just barely make out the outline of the boy. He knelt with his head between his hands, his body huddled against a pew. Praying. Phoebe paused several feet away and waited. After a moment she felt energy seeping from the boy’s skin, raising the hairs on hers. Cold and electric, it meant one thing: the boy had only one heart. She couldn’t risk him seeing what she had come there to do. That meant waiting. Just then, something stirred behind her. Nya Jade is a singer-songwriter and author based in San Francisco. Her music videos have aired on the VH1, BET, and MTV networks. USA Today hailed Nya as a “young female troubadour worth keeping your eyes and ears on,” in an entertainment feature on up-and-coming singer-songwriters. “Her cool singing voice recalls Sade,” said the LA Times. 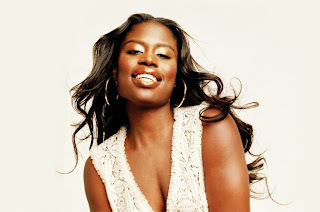 Between writing and performing new music, Nya took a musical sabbatical to focus on writing a novel—an endeavor she found quite daunting, until she began looking at each chapter as a verse in a very long song. 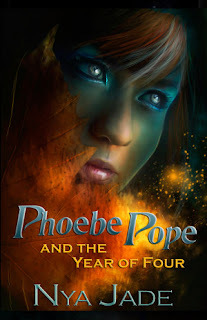 Phoebe Pope and the Year of Four is her first novel. In her free time, Nya enjoys hanging out with family and friends, searching for amazing gluten-free desserts, and bargain hunting for her next pair of funky shoes. Nya holds a B.A. in Economics and an M.A. in Sociology, both from Stanford University. I saw your post on Book Blogs about your new blog design! I love the pink and purple and your Christmas banner! I'm a new follower and hope you'll check out my blog too. Well thanks!! :) I'm so glad you were able to stop by and thanks for following, I'll for sure check out your blog too!